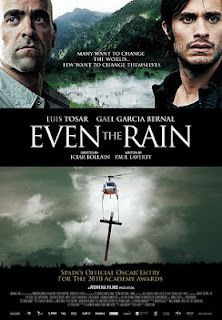 Even the Rain (Spanish: También la lluvia) is a 2010 Spanish drama film directed by Icíar Bollaín about Mexican director Sebastián (Gael García Bernal) and executive producer Costa (Luis Tosar) who travel to Bolivia to shoot a film depicting Christopher Columbus’s conquest. Sebastián and Costa unexpectedly land themselves in a moral crisis when they and their crew arrive at Cochabamba, Bolivia, during the intensifying 2000 Cochabamba protests, which their key native actor Daniel (Juan Carlos Aduviri) persistently leads. The film was directed by Icíar Bollaín, based on a screenplay by Paul Laverty. The film received nominations and won awards internationally, including an Ariel Award for Best Ibero-American Film and three Goya Awards, one of which was Best Original Score for the work of Alberto Iglesias. Additionally, the film was nominated as Spain’s entry for the 2011 Academy Award for Best Foreign Language Film. Mexican filmmaker Sebastián (Gael García Bernal) and his executive producer Costa (Luis Tosar) arrive in Cochabamba, Bolivia, accompanied by a cast and crew, prepared to create a film depicting Columbus's first voyage to the New World, the imposition of Columbus’s will upon the natives, and the subsequent indigenous rebellion. Cognizant of his limited budget, producer Costa (Luis Tosar) elects to film in Bolivia, the poorest country in South America. There, impoverished locals are thrilled to earn just two dollars a day as extras in the film, and willingly engage in physical labor for set preparation. Costa saves many thousands of dollars by having underpaid extras perform tasks meant to be completed by experienced engineers. Sebastián casts a local man named Daniel (Juan Carlos Aduviri) in the role of Atuey, the Taíno chief who led a rebellion against the Europeans; and Daniel's daughter Belén in a crucial role as well. At that time, although their first encounter with Daniel smelled like trouble to Costa, enough to oppose his casting, Sebastián is unaware that Daniel leads impassioned demonstrations against the water privatization that the Bolivian government had agreed to. Filming begins smoothly despite the alcoholism of actor Antón, (Karra Elejalde) cast as Colón (Columbus), but when Costa observes Daniel’s revolutionary involvement, he grows uneasy. Daniel pretends to acquiesce to Costa's insistence that he stop protesting, but heedlessly continues and sustains facial wounds in a clash with the police. At this point, Costa bribes Daniel with thousands of dollars to wait for filming to conclude before participating in the rebellion again. Daniel agrees, accepting the money, but remains active in the protests, eventually becoming bloodied and imprisoned. Sebastián experiences moral conflict and begins to doubt the likelihood of the film’s completion, but is reassured by Costa who bribes the police for Daniel’s temporary release in order to film a key movie scene. Upon this scene’s completion, police arrive in the Bolivian jungle to once again detain Daniel but are besieged by the film’s extras and Daniel escapes. That night when starring actors Juan and Alberto see the latest news reports showing war-like violence in Cochabamba, they become worried to the extent that they demand to leave. Sebastián begs that they stay and they hesitantly agree. The next day, as the cast and crew prepare to depart for filming, Costa is met by Daniel’s wife, Teresa, who desperately implores him to assist her in finding her daughter Belén, who has disappeared into the protests and is reportedly wounded and needing hospitalization. Teresa’s persistence wins over Costa’s conscience, despite Sebastián's equally impassioned insistence he leave for the airport and safety with the rest of the cast and crew. After Costa and Teresa's obstacle-laden drive through riotous Cochabamba, Belén’s life is preserved, but her leg does not fully heal. Meanwhile, the rest of the crew is stopped by a military blockade and all except Antón leave Sebastián to journey home. The revolution ends shortly thereafter with the departure of the multinational water company, but Cochabamba is left in ruin from the conflict. Costa expresses hope that the film will be finished after all, and Daniel emotionally presents him with a vial of Bolivian water in appreciation for his life-saving efforts. A beautiful combination of an old man's struggle to continue his goathearding life; the birth of a baby goats; a tree which becomes charcoal; and the lives of the simple people in the hills of Calabria. We see the stages of life through beautiful imagery at times dramatic and at times comical. 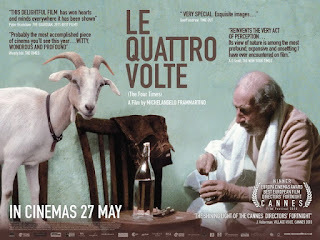 Jonathan Romney, writing in The Independent on Sunday, described Le Quattro Volte as "both magnificent and magnificently economical", remarking "I like to think that it's possible for cinema to make profound cosmological statements without having to go all Cecil B. DeMille".Romney finds the film "the freshest and the deepest film I've encountered in a while", and "one of those rare films that anyone could enjoy, whether or not they normally care for slow Italian art cinema"
There is virtually no dialogue in the film. The film was written and directed by Michelangelo Frammartino and stars Giuseppe Fuda, Nazareno Timpano, Bruno Timpano and Artemio Vellone.